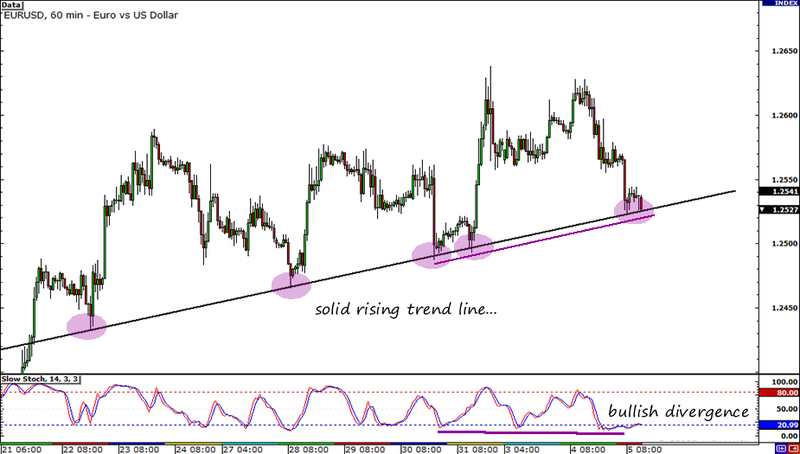 EUR/USD: Eyeing Support at the Rising Trend Line – Profit Target Hit! I must admit that this trade gave me quite a scare at first. When I jumped in, price quickly pierced through the rising trend line, making me think that it was going to head down fast. I had half a mind to close already, but I ultimately decided to let the trade breathe. As the London trading session rolled along, price slowly made its way higher. According to many news reports, the pair rallied due to the market’s positive outlook on the ECB Interest Rate Decision. I’m very happy that my fundamental and technical analysis on the pair was spot on. 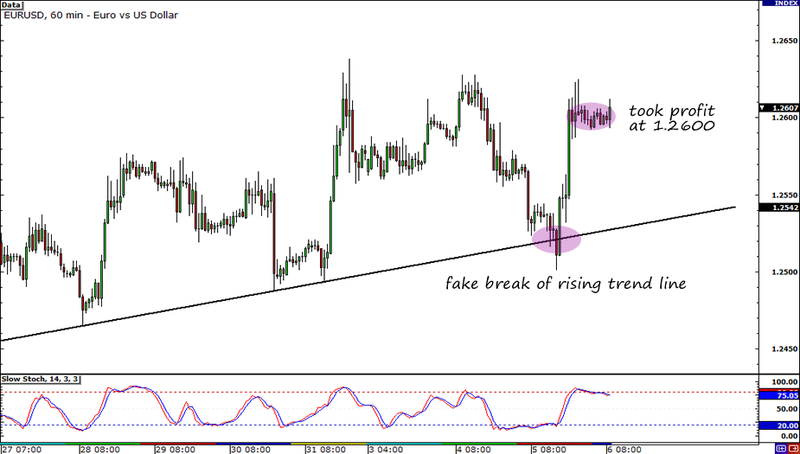 Do you see that very clear uptrend in EUR/USD‘s hourly chart? I think going long ahead of the ECB interest rate decision might be a good idea so I bought the pair at market! On the fundamental side of things, it seems that investors are anticipating a big move from the ECB. I’m anticipating this optimism to last in today’s trading and provide the euro with support, enough for EUR/USD to rally to 1.2600. I’ll be honest and tell you that I have no idea what to expect when ECB President Draghi announces the central bank’s monetary policy decision. With that said, I promise to close my trade ahead of the event. I don’t want to get burned when volatility surges tomorrow! But just in case we do see volatility pick up ahead of the rate decision, I placed my stop well below the most recent low at 1.2475. I think that would give my trade enough room to move. Long EUR/USD at market (1.2524), SL at 1.2475, PT 1.2600, 1% risk. Risk disclosure. What do you think of my trade idea? Hit me up! “Huck loves her bucks!” I always say. The problem, of course, is how to make those bucks!! I'll be posting my adventures as I traverse the forex world, while trying to catch some pips along the way. To do this, I will make use of classical charting methods as well as develop my own mechanical system. Not only will I talk about FX, but I'll also share how my day went along with any currency trade updates. Hopefully, by the end of this tale, I'll be able to achieve my goal of becoming a consistently profitable foreign exchange trader.